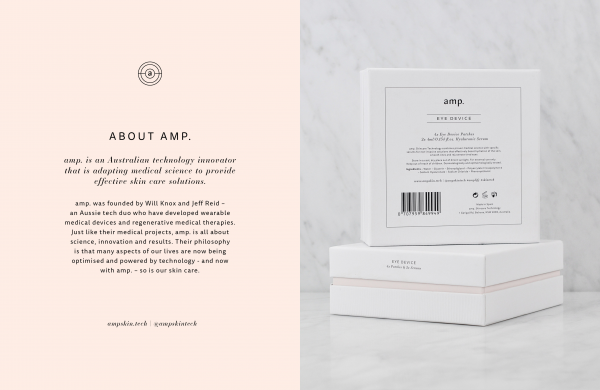 Australian technology innovator amp. focuses on adapting medical science to provide effective skin care solutions. 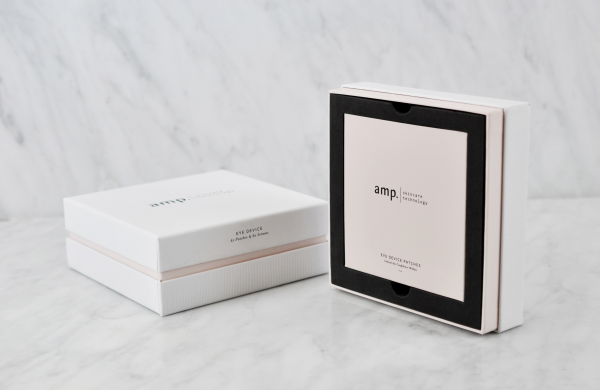 With the launch of their first product ‘Hyaluronic Eye Device Patches’ Made Somewhere was tasked with the creation of the amp. brand, packaging, collateral and ultimately taking the product to market. Together Made Somewhere and amp. focused on creating a premium, technology led skincare brand, with the user at the centre of the process. Made Somewhere’s brief was in the creation of the amp. brand, packaging, illustrations, collateral and taking the product to market. 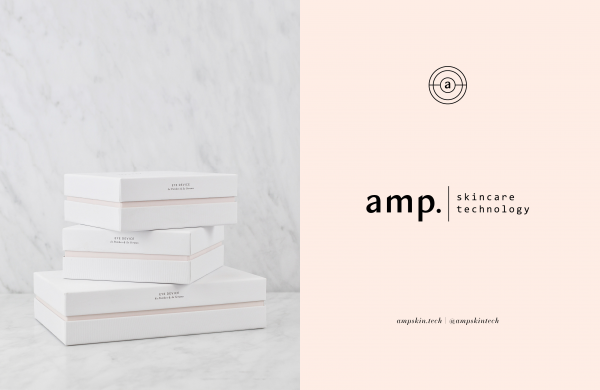 The brand had to be both aspirational and achievable and demonstrate the technologic led background of amp. as well as sit in the beauty realm. As amp. 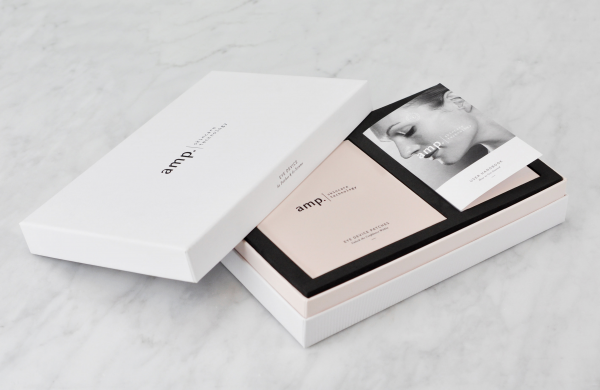 was a premium skin care solution and the first true wearable, digital anti-ageing solution on the market in Australia it was imperative that the brand and packaging were premium, engaging and user-focused in design and functionality. The brief required a coherent creation of brandmarks, brand icons, colour palettes, typography, illustration, copywriting, collateral, brand patterns and art direction. 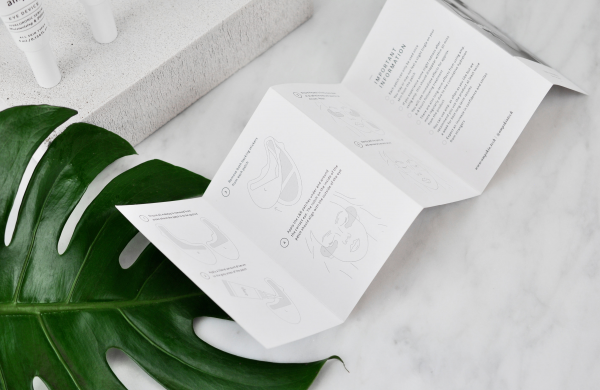 These were then used to create the first two packaging requirements for the Classic Pack and Recharge Pack of the ‘Hyaluronic Eye Device Patches and Serums’. Made Somewhere and amp. were aligned in wanting the packaging and user experience to be highly considered and engaging and not stock standard in any way. 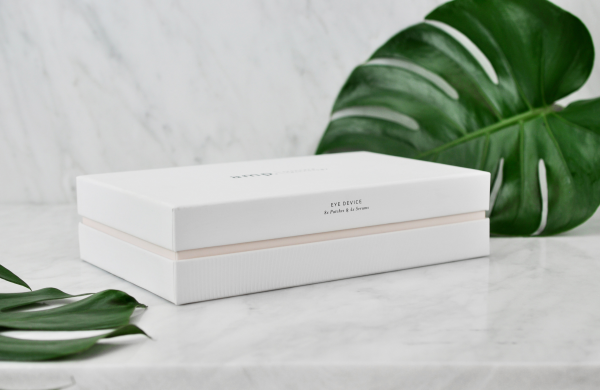 Made Somewhere created a flexible and multi-purpose brand suite and customised packaging that focused on the consumer journey and showcased every element of the brand with care and precision. 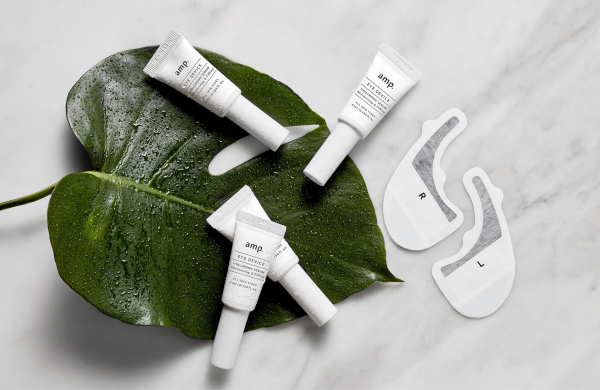 The brand and supporting material had to resemble the founders technologic backing and understanding of the science behind the product, which would bring a new lease to the cosmetic realm. To address this Made Somewhere had to find a balance between aesthetic beauty and scientific standing through the branding and packaging. 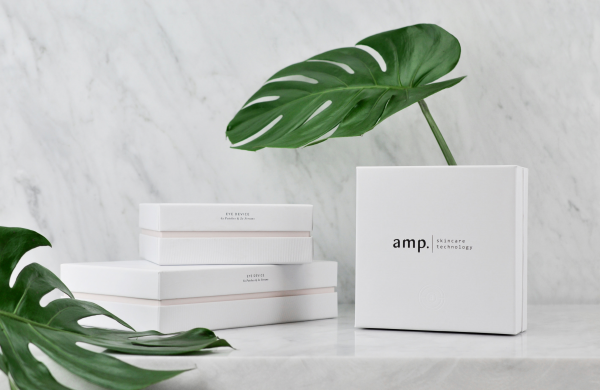 The brandmark and supporting brand icon are minimal and refined, giving subtle hints to the technological process and skincare realm, through their typography and layout. A brand icon supports the brand, referencing an ‘a’ within a circular device providing homage to that of the ampere meter symbol used within electronics. Within the packaging products were individually housed in multi-layered compartments that the user could progress through with ease and satisfaction. 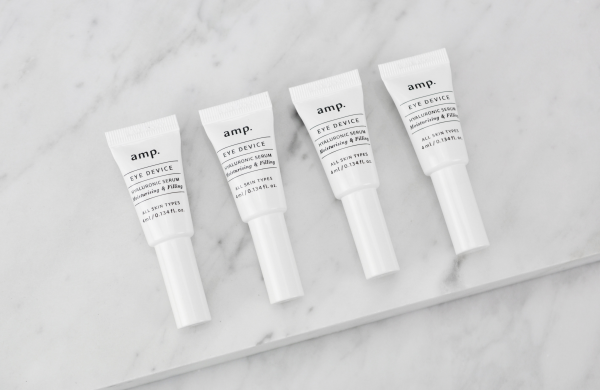 From the hyaluronic serum tubes to the micro-battery patches and information manual, each element of amps. aesthetic and functionality performance was considered throughout the design and manufacturing. Creating aspiration for a sophisticated product was the challenge that needed to be addressed. The target market had to see the value in the brand (product and packaging) and have a desire to try the product over other products. There are many skincare products on the market but not as many have such a sophisticated and extensive science background – we needed to convey this to the market. The packaging is innovative and bespoke, taking the consumer on a journey with various touch points to create a positive and unexpected experience. The branding is minimal with a scientific edge and premium aesthetic, speaking to the target market with confidence and trustworthiness. 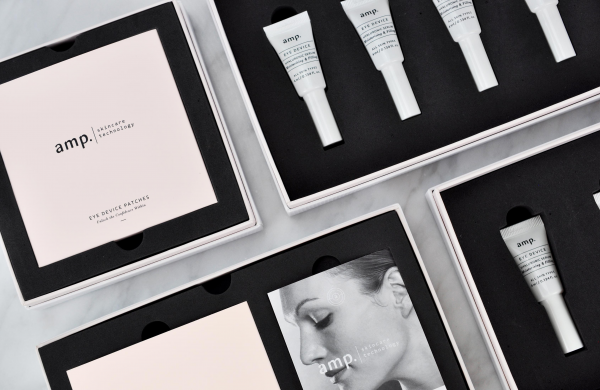 A brand pattern, blind debossed into the packaging is used to reflect the science of skin and various skin effects such as wrinkles, which are being addressed by the product. This gives a two-tone approach to the product (before and after) to aid the experience. Information manuals and illustrations are used to aid the process and give understanding into the technological background of the product. The packaging and user experience were highly considered and a focal point to the creation of the brand and packaging. From the multi-layered compartments, sophisticated packaging materials and construction, printing features and finishes (blind deboss, pattern-making etc) to the practicalness (water resistant finishes) each element was highly considered and analysed. The engagement and results of the design and product have been highly favourable with fantastic reviews to date.